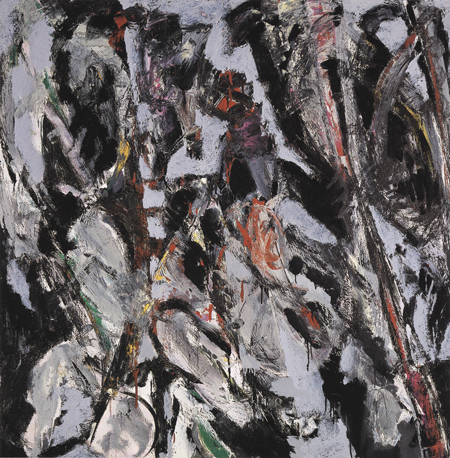 Lee Krasner was a truly remarkable figure in post war art and was a critically recognized artist in the Abstract Expressionist Movement. She was only one of four female artists to have a retrospective show at the Museum of Modern Art. Although usually overshadowed by her husband, Jackson Pollock, it was Krasner who introduced him to other painters like Willem de Kooning, who she met through being a member of the American Abstract Artists. From her early studies at the National Academy of Design, she gained an extensive artistic education and became highly skilled at rendering the human figure all of which is now buried in her non-objective work. When she began creating collage paintings, she explored contrasts of light and dark colors, hard and soft lines, organic and geometric shapes. She found her voice but throughout her career, she never adopted a singular style. Having studied with Hans Hofmann, as did many of her contemporaries, and although living in a very turbulent time, both domestically and in the world at large, Krasner’s circumstances shaped her into a fiercely independent artist with great grit, vision and empathy. She was always committed to her art, and in it we can see that she transcended numerous hardships to show us that eventually the inner and outer aspect of man will interlock. We can feel her enduring strength.